Would you like to triple your income as a real estate agent or broker? Close thirty or fifty or more transactions a year, rather than the national average of twelve? Reduce your advertising expenses by half and cut marketing costs per transaction by forty percent? Can you imagine converting 100 percent of your prospect inquiries into customer presentations? Working a four–day week while maintaining a six–figure income? Cashing out of your practice financially independent yet still young enough to enjoy the fruits of your labors? If these questions sound like an impossible dream, then reality is about to give you a very pleasant surprise. Complete with an invaluable collection of marketing tools never before assembled in one place and all the essential contact information you?ll require to find what you need easily, Real Estate Rainmaker ® brings you a torrent of indispensable principles, techniques, and savvy insider?s tips that will flood your practice with customers, profits, and success beyond your wildest dreams. The real estate industry has never been more active?or more competitive?than it is today. Anyone who wants to achieve real success must have a foolproof marketing system to create prospects, convert them into customer appointments, and turn past clients into future referral sources. Don?t let your career languish while you waste precious marketing dollars through trial and error. Let Real Estate Rainmaker ® start making you a rainmaker today. Nine Deadly Truths That Could Kill Your Business. A Better Way: All You Do Is Close. STEP 1: CREATE CUSTOMERS WITH LEAD GENERATION. Media Strategies to Win in Any Market. Offer Strategies That Attract Prospects Like a Magnet. Creative Strategies to Beat the Competition Every Time. STEP 2: CAPTURE CUSTOMERS WITH PROSPECT FOLLOW–UP. Customer Conversion Strategies to Maximize Sales. STEP 3: KEEP CUSTOMERS WITH LONG–TERM CONTACT. Customer Retention Strategies for Optimum Profits. Creating a Perpetual Referral Machine. WRITING A MARKETING PLAN IN SIX EASY MORNINGS. GROWING YOUR PRACTICE TO SELL. Building a Real Estate Rainmaker Trophy Database. Exit Strategies to Cash In Or Cash Out. 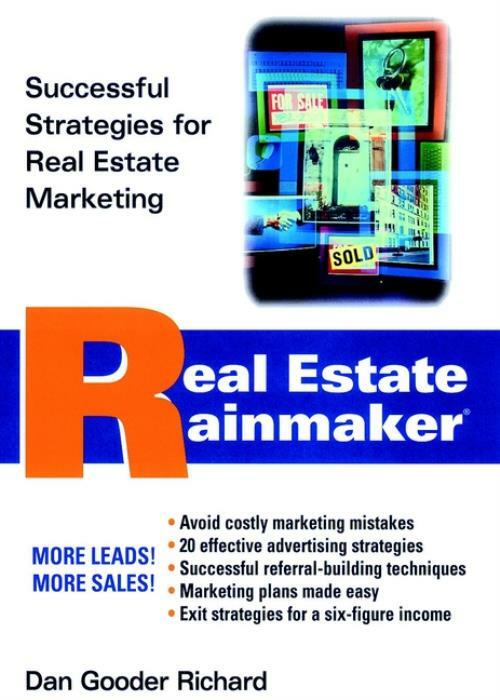 Real Estate Rainmaker Resource Guide.